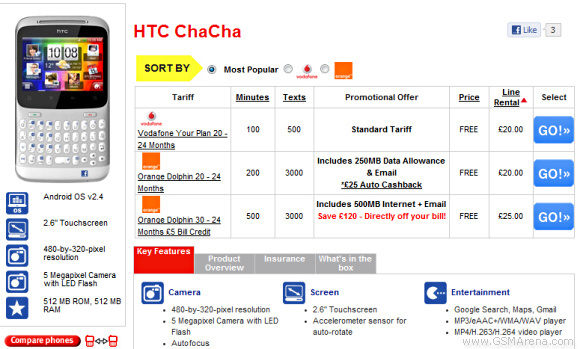 The HTC ChaCha is now available for purchase through the Phones 4U dealer in the UK. The Facebook-centric messenger can be yours for free on a two year 20 quid a month Vodafone contract or a whopping 300 pounds if you'd prefer to go pay-as-you-go. Update: It seems that Carphone Warehouse is also listing the HTC ChaCha as available in the UK. Prices are similar to those of Phones 4U, save for the sim-free price of 230 pounds. The controversial ChaCha is a 2.6-inch HVGA (320x480) full-QWERTY messenger phone with a dedicated Facebook button and Gingerbread 2.4 on board. The HTC Sense on it is also socially integrated to make your day-to-day life more involved with your online peers. can this phone be available without contract? if yes wt price it is available in uk?